Spiritual awakening is not a special feeling, state, or experience. It is not a goal or destination, somewhere to reach in the future. As the Buddha was trying to tell us (though few actually listened), it is not a superhuman achievement or attainment. You don’t have to travel to India to find it. It is not a special state of perfection reserved for the lucky or the privileged few. It is not an exclusive club. It is not an out-of-body experience, and it does not involve living in a cave, shutting off all your beautiful senses, detaching yourself from the realities of this modern world. It cannot be transmitted to you by a fancy bearded (or non-bearded) guru, nor can it be taken away or lost. You do not have to become anyone’s disciple or follower, or give away all your possessions. You do not have to join a cult. You do not have to follow anyone. Rather, is a constant and ancient invitation – throughout every moment of your life – to trust and embrace yourself exactly as you are, in all your glorious imperfection. It is about being fully present and awake to each precious moment, coming out of the epic movie of past and future (“The Story of Me”) and showing up for life, knowing that even your feelings of non-acceptance are accepted here. It is about radically opening up to this extraordinary gift of existence, embracing both the pain and the joy of it, the bliss and the sorrow, the ecstasy and the overwhelm, the certainty and the doubt. Knowing that you are never separate from the Whole, never broken, never truly lost. There is only THIS; the present scene of the movie of your life. Come out of the epic story of time and space, past and future, regret and anticipation, and the seeking of different states and experiences, even the search for spiritual enlightenment. Relax your habitual focus on ‘what’s gone’, ‘what’s not here yet’ – things you cannot possibly control from where you are. Come out of the story of ‘My Life’ and allow yourself to be fascinated by what is alive, here, right now. Be curious about this very alive dance of thoughts, sensations, feelings and impulses that is happening where you are. Remember, Now is the only place from which true answers can eventually emerge. The present moment is your true home, prior to time and space. It is all there is; the calm in the midst of the storm. Pain is not the real problem; the real problem is our thinking about pain, our resistance to it, our attempt to escape it and get to an (imaginary) future. The real problem begins when we start ruminating on our pain, our sadness, our fears, our anger; brooding over our discomforts, rewinding and fast-forwarding the movie of our lives! We chew on yesterday’s and tomorrow’s sorrows, rather than directly exploring and experiencing today’s experiences as they arrive. We add an unnecessary layer of rumination and resistance to life, and this creates suffering. The invitation? Come out of past and future, seeking and striving, and meet life in the raw, right now, without judgement, and without the expectation that ‘peace’, ‘relaxation’, ‘enlightenment’ or any kind of shift will result. Meet the moment on its own terms; see it all as a gift. Show up, for the pleasant and unpleasant, the pleasurable and the painful, without an agenda. See thoughts and sensations as neutral and impersonal events in awareness. Just like sounds that we hear, thoughts and physical sensations arise and disappear spontaneously, like waves in the ocean of You. They cannot be controlled, deleted, or escaped. Cultivate the same gentle attitude towards thoughts and sensations as you already have towards sounds. Meet all thoughts and sensations with an attitude of kindness and curiosity. See them as welcome guests in your presence. Thoughts are not you, and they are not reality; they are only suggestions, possibilities, rumours, propaganda, judgements, voices, images, rewinds and fast-forwards coming and going – clouds in the vast sky of you. Don’t try to still, silence or stop, drop, delete or control them. Be the space for them, even if they are very active right now! Remember, if you notice thoughts, if you are mindful of them, you are not trapped in them. They do not define you. You are the silent container, not the contained. Be what you are – thought’s unchanging embrace, the vastness in which thoughts can come and go as they please. Breathe into uncomfortable sensations; give them dignity. Honour them rather than closing off to them, starving them of warmth. On the in-breath, imagine or feel your breath moving into the neglected and tender area, infusing it with life and love. Fill the uncomfortable area in your body with oxygen, warmth and dignity. Don’t try to ‘heal’ the sensations, or even ‘let go’ of them. They want to be met, honoured, included in the present scene. Assume that even discomfort holds intelligence; that it’s not ‘against’ you. Know that true joy is not the absence or opposite of sadness or pain, but the willingness to embrace it all. Acceptance doesn’t mean that an unpleasant thought or feeling will go away; it may stay awhile. Don’t try to accept it (as this is often resistance in disguise) but acknowledge that it is ALREADY accepted, already here, already part of the scene. Treat it as if it perhaps will always be here! This removes the pressure of time (trying to make it go away, wondering why it’s “still here”). It IS here, now. Bow before THIS reality. Be curious. And allow any urges, any feelings of frustration, boredom, disappointment or even despair, to come up too and be included. They are all part of the present scene, not blocks. Even a feeling of blockage is part of the scene! Often we focus so much on the goal or destination that we forget the journey, disconnect from each precious step, and stress is created, the sense that we are ‘Not There Yet’. 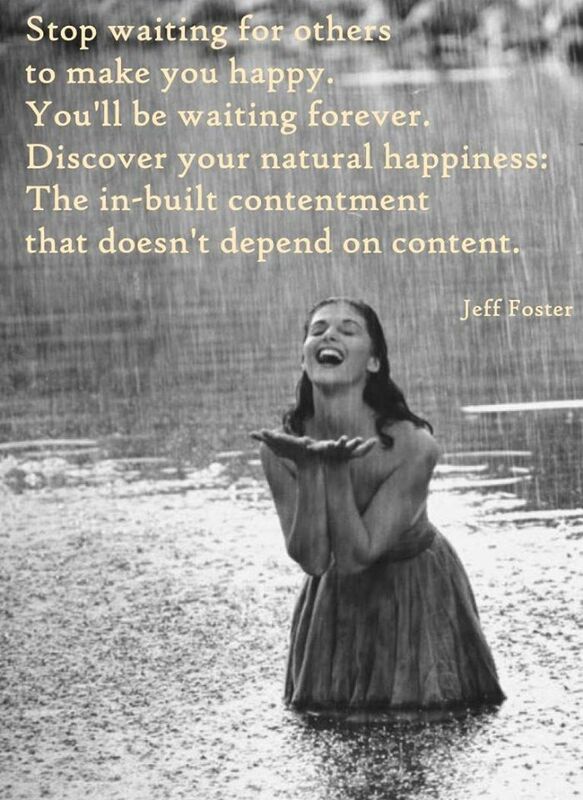 Yet joy can only be found in the here and now, and has nothing to do with goals, destinations, or getting what you want. Take the focus off the 10,000 steps to come, the 10,000 steps you have not yet trodden, the 10,000 things that are missing right now, and remember the present step, this ancient living ground, your own intimate presence. Breathe. Feel the life in your body. Often we don’t know where we are headed, and that’s perfectly okay. Befriend any uncertainty, doubt, trepidation that you feel; learn to love this sacred place of no answers. It is alive, and creative, and full of potential. If you realize that you’re lost in a story, that you’re disconnected, that you’ve forgotten the moment, celebrate! You have just woken up from a dream. A great intelligence is alive in you, a power to realize and connect. You have stepped out of millions of years of conditioning. Don’t punish yourself for forgetting, but celebrate your ability to remember! The moment doesn’t mind that you forgot it! Forgetting is a perfect scene in the movie. Allow yourself to forget, sometimes! Be humbled by the journey rather than trying to be ‘perfect’. Doubt, disappointment and disillusionment will be constant friends along this pathless path. There is no destination in presence, no image of ‘success’ to live up to. You cannot go wrong, when there is no image of ‘right’. 10. STOP COMPARING; YOU ARE LIFE ITSELF!